슈테파니 빈터는 2001년부터 2007년까지 비엔나예술학교와 베를린예술대학교에서 순수 회화와 후기 개념미술을 공부했다. 2009년 그녀의 첫 단편 <도플갱어>(2009)는 오스트리아디아고날영화제를 비롯, 각종 해외 영화제에 소개되었을 뿐 아니라, 2010년 부산국제단편영화제에서 우수작품상을 수상했다. 또한 최근작 <슬픈 사막 - 어떤 로봇의 이야기>(2015)는 홍콩영화제에 소개된 이후, 비엔나독립단편영화제에서 베스트 오스트리안 음악영화상을 수상한 바 있다. 그녀는 살롱 하이브리드 프로덕션의 설립자이자 예술감독이기도 하다. Stephanie Winter studied Painting & Post-Conceptual Art Practices from 2001–2007 at the Academy of Fine Arts Vienna and the Berlin University of Arts. 2009 her first short film The Doppelganger (2009) was premiered at the Diagonale in Graz. In 2010 she won the “Excellence Award” at the Busan International Short Film Festival. 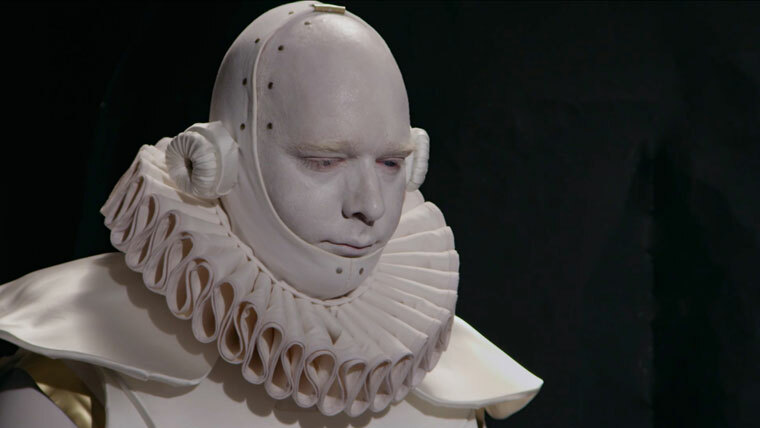 Her new Film Tristes D éserts - A Robots Tale (2015) was premiered at the Hong Kong Film festival and was awarded for “Best Austrian Music Video” at the Vienna Independent Shorts. Shi is founder and artistic director of the experimental performance & production platform Salon Hybrid. 잉 량은 상하이 출생으로, 베이징과 충칭에서 연출을 공부했다. 첫 번째 장편 <오리를 등에 진 사나이>(2005)는 도쿄필름엑스영화제에서 심사위원특별상을, <다른 반쪽>(2006)은 전주영화제 우석상을 수상했다. <호묘>(2008)는 브리스번영화제 국제비평가상을 수상하였고, 이후 제작한 단편 <위문>(2009)은 로테르담영화제 단편경쟁부문 타이거상을 수상했고, 2013 부산국제단편영화제 개막작이기도 했다. 2012년 <아직 할말이 남았지만>(2012)은 로카르노영화제 감독상과 여우주연상을 수상했다. 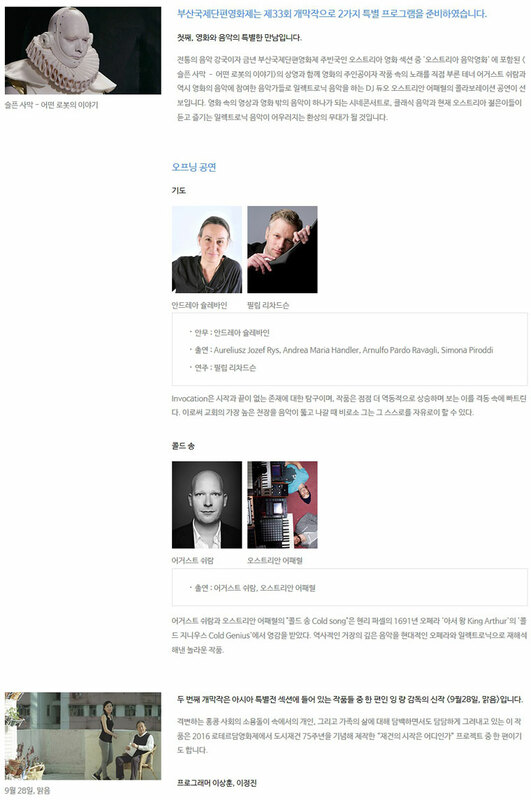 현재 그는 홍콩공연예술학교와 홍콩침례대학교에서 영화를 가르치고 중국독립다큐멘터리 랩의 멤버이기도 하다. Ying Liang, Chinese independent filmmaker, was born in Shanghai. He had studied in Beijing and Chongqing. He made his feature directorial debut in Taking Father Home (2005), and since then, has made 3 more feature films and more than a dozen shorts, including The Other Half (2006), Good Cats (2008), When Night Falls (2012) and Condolences (2009). These were greeted with a number of important prizes at international film festivals, including the Special Jury Prize at Tokyo FILMeX International Film Festival, the Tiger Award for the Best Short at International Film Festival Rotterdam, Best Director & Best Actress at Locarno International Film Festival, etc. Because of his last feature film When Night falls (2012), he exiles in Hong Kong now. At the moment, he is one of the part time lecturers of Hong Kong Academy for Performing Arts and Hong Kong Baptist University, one of the founders of Chinese Independent Documentary Lab.